myoldmac.net - Las Vegas Pong Video Console - Buy it! 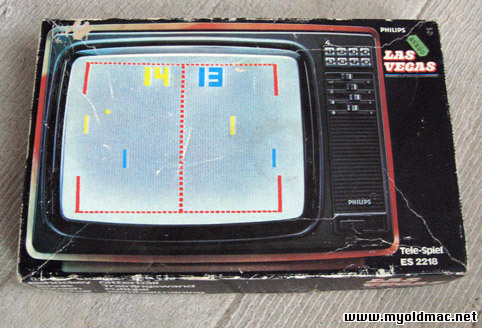 The legendary Las Vegas console in its original package. 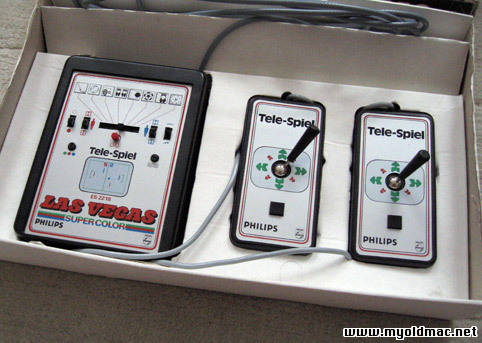 The console is in working order but the reset buttons on the paddles are unreliable, maybe you need to clean them. No power supply included, you need a universal 9 vold AC adapter. Sold without guaratee due to the age. Please see the Photos. There is a female DIN plug at the bottom-right part of the case. It is used to connect an optional light-gun to play the two shooting games. There are switches to control the different options like ball speed, paddle size, angle 20°/40°, manual/auto service. There are two buttons: reset and serve. There is even a TV channel selection knob to adjust the picture on the TV. 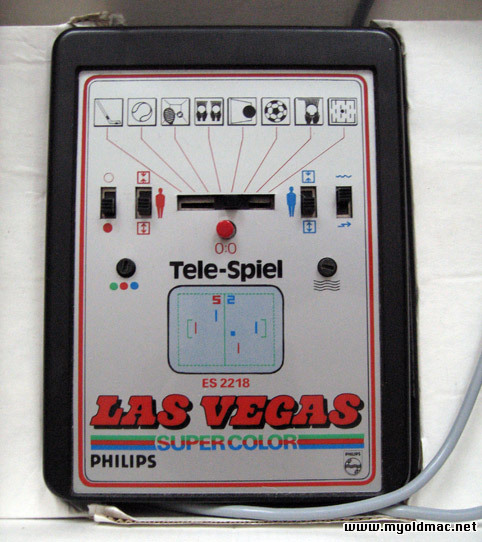 Die legendäre Las Vegas Tele-Spiel ES-2218 (8 Spiele, color display, vertikale & horizontale Bewegungen) in original Verpackung! Die Konsole funktioniert, die Resetknöpfe an den Paddles sind aber ein wenig unzuverläßig. Eventuell muß man die mal reinigen.Kommt ohne Netzteil man benötigt einen universal 9 vold AC Adapter, Verkauf ohne Garantie aufgrund des Alters. Bitte sehen Sie die Photos.